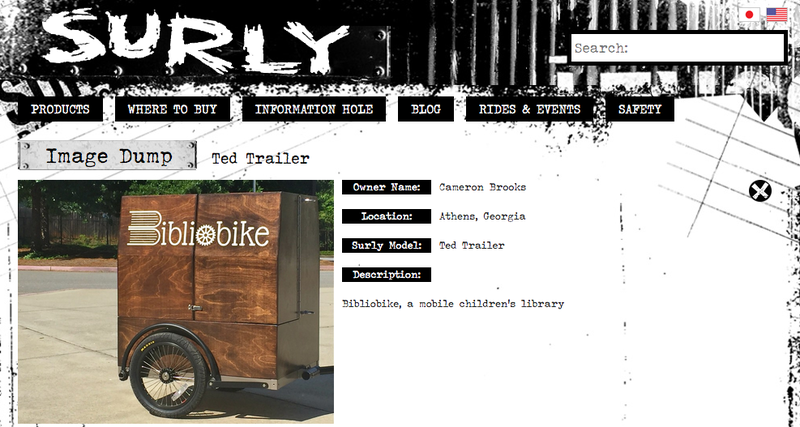 A couple photos were sent to Surly Bikes a couple months ago, and they’re now included on the website’s Image Dump. Click here to see how other folks from around the world use their bikes and trailers. Rachel Watkins snapped the photo above for Avid Books on Instagram. Click here to visit their page. Read the Red and Black article written by Holly Roberts here. Click the screenshot above, or right here to read Hilary Butschek’s article for the Athens Banner-Herald. Click the screenshot above of the Boston Public Library’s book bike, or here for Kat Khoury’s piece in the Flagpole Magazine. Caitlyn Richman is a journalism student at UGA who reached out for an interview to include in a comprehensive piece about literacy outreach in the Athens area. You can read the article here. Caitlyn also created an interactive map of Little Free Libraries around town. Click here to explore spots where you’ll find free books.